Cats are not fond of loud noises and can get skittish about gunshots or sudden claps of thunder, but it’s mainly dogs who suffer – and who show their fears by shaking, shivering or trying to hide. The fear of loud noises is amongst the more stubborn behaviour problems that veterinarians treat. With a little work and patience however, dogs can learn to tolerate, if not appreciate, loud noises. Create a safety zone. In the past, dogs were den-dwelling animals and they are still attracted to small spaces, especially when they’re frightened. They like to feel sheltered from the elements and not exposed and vulnerable. Dogs that are afraid of loud noises will gravitate towards small cozy hiding places – under beds, inside cupboards etc. You can help by creating a comfortable hiding place that they can call their own. Try putting the dogs bed in a more “sheltered” position, like beneath the stairs, behind a chair or in a dark corner, where the dog can feel protected. That may be all she needs. Take away the fear. Dogs don’t process their experiences like people do, in other words they do not learn from an experience. Their first fireworks experience is as scary as their tenth! It is up to their owners to change their thinking so that loud noises do not frighten them. Animal behaviourists use a system called desensitization. This basically means getting them used to the noise. There are many ways to go about it, but here is a simple technique. Gradually expose your dog to low levels of whatever it is it fears. Buy a recording of a thunderstorm and play it for about 15 minutes at a very low volume. Praise your dog for not reacting to the noise. Playing with the dog during this low level noise is also a good idea so that the dog hears the noise in the background and is distracted. On the second and third days increase the volume slightly and continue praising the dog for non-reaction to the noise. Again games are very important to link a positive feeling to the noise. With daily practice the dog will get accustomed to the noise and the positive effects. What the dog will discover is that thunderstorms and fireworks are not such a big deal. Don’t be tempted to hurry this process as you could scare the dog in the process. It must be handled very carefully. Sometimes this process can take a few months. Whether or not you are practicing the desensitization programme, you should always act as if there is nothing to be afraid of. If there is a loud thunder clap, don’t react at all. Your dog will take its cue from you. If you react, then the dog will react as well. The more you cuddle your dog during this time, the more it thinks that being scared has its rewards and will therefore continue this behaviour. Dogs will never like loud noises, but you can teach them that thunderstorms are nothing to be afraid of. By starting a game in the rain, the dog learns that rain and storms mean fun. Repeat these exercises every time you hear thunder or rain. Play fetch with a favourite toy; the dog is distracted and enjoys the time with you as well as getting over his fear of noise. 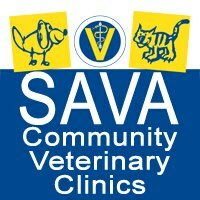 Ask your veterinarian about medication. Some dogs become so stressed with the noise of a thunderstorm, that nothing seems to work. In this case it is advisable to seek the help of your veterinarian. Sedatives or anti-anxiety drugs can be prescribed to get the dog through difficult periods such as Guy Fawkes or New Years Eve fireworks. Often these drugs are also used in combination with a desensitization programme. 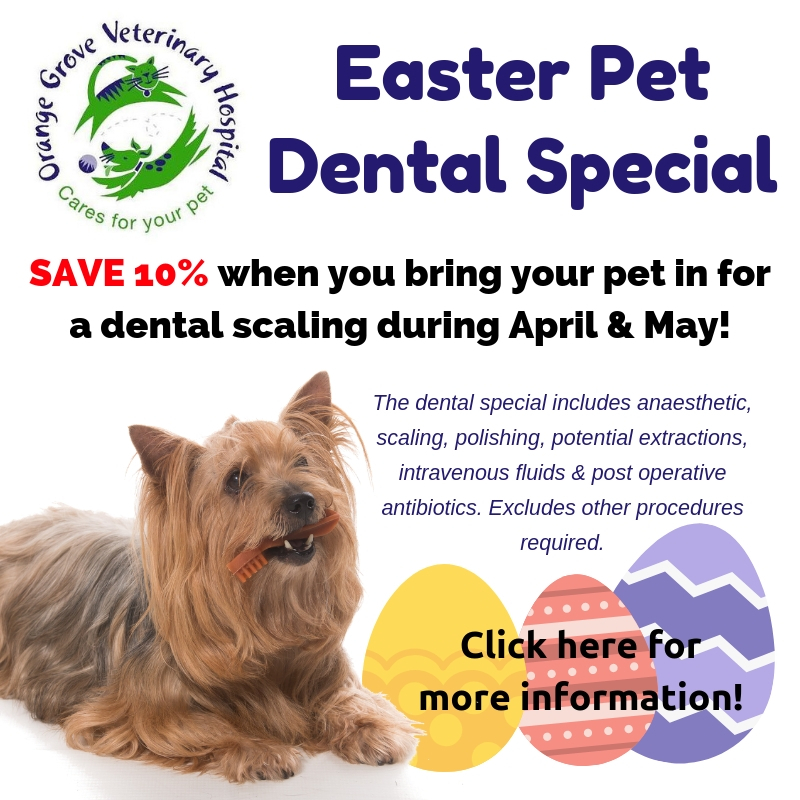 Calm Eze is available at Orange Grove Vet! 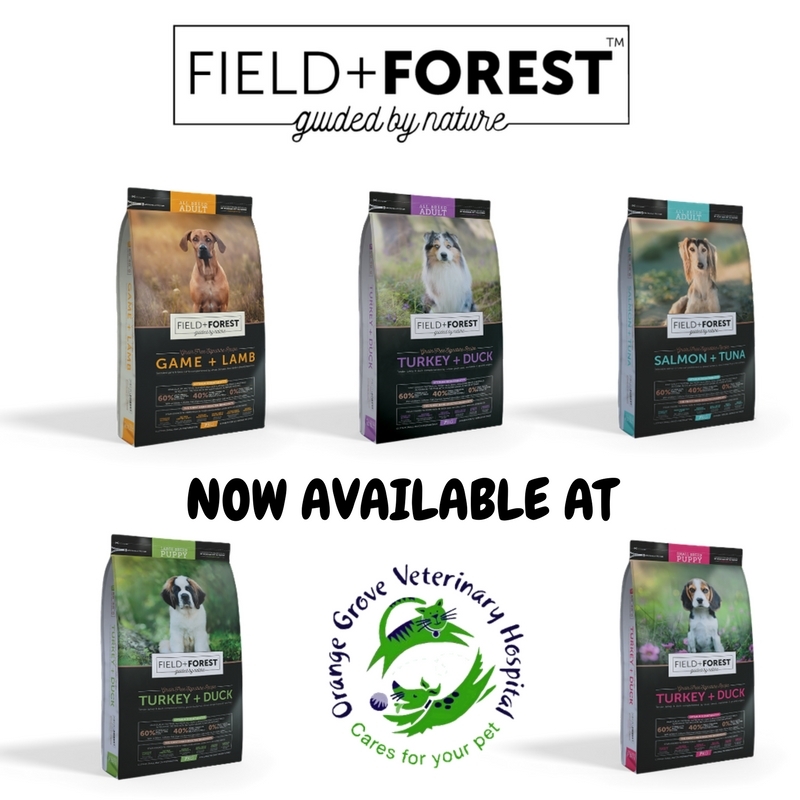 CalmEze is a nutritional aid which reduces the stress and anxiety in dogs and cats. The product comes in three forms; beef flavoured tablets for dogs, caramel flavoured gel for dogs and salmon flavoured gel for cats. CalmEze can be used in stressful situations to relive anxiety such as separation, kennelling, thunderstorms or fireworks. CalmEze can be used in acute occurances or for long term management of behavioural problems. 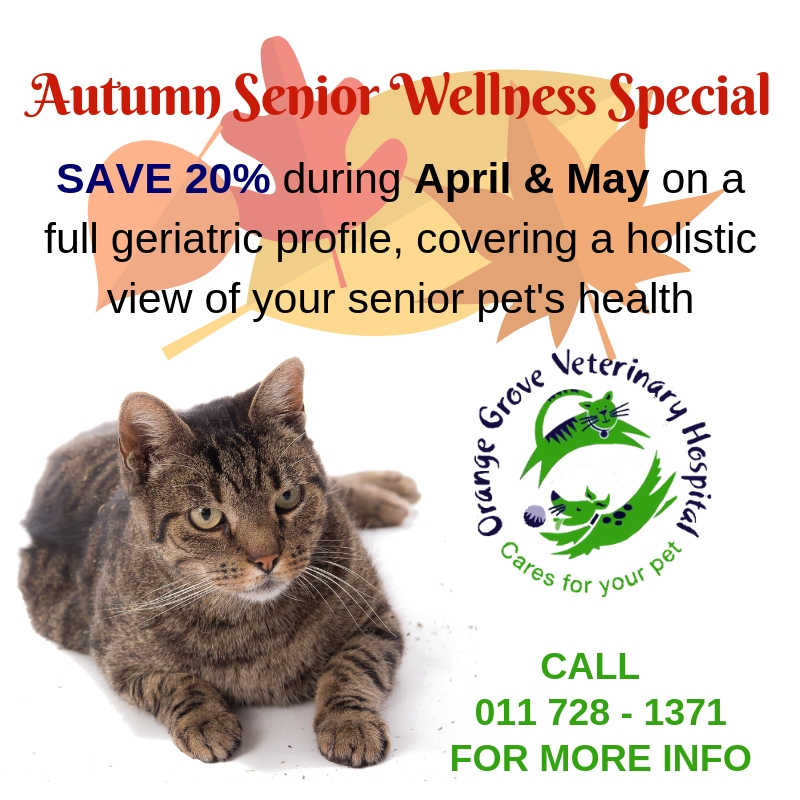 For more information contact Orange Grove Vet on 0117281371 or email ogvh@iafrica.com. Please share! 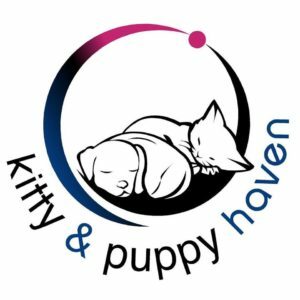 We have 4 gorgeous kittens approximately 2 - 3 months old looking for furever homes. Tortoiseshell girl, black & white girl, grey & white boy and tabby boy. They have all been dewormed and vaccinated. For more information contact us on 0117281371 or email ogvh@iafrica.com.